Does Eating Rice Make You Fat? Weight watchers and normal weight people avoid rice in order to reduce their weight or maintain it. But does eating rice make you fat? NO! I’m not sure when this myth started and who started it but it has spread like wildfire. Most people on a weight loss diet avoid eating rice thinking that rice will increase their weight or rice will not aid in weight loss. If this were true, all Asians should have been fat because most Asian countries use rice as their staple food. The fact that many Asians are much slimmer than their Western counterparts itself is proof that rice doesn’t cause weight gain. 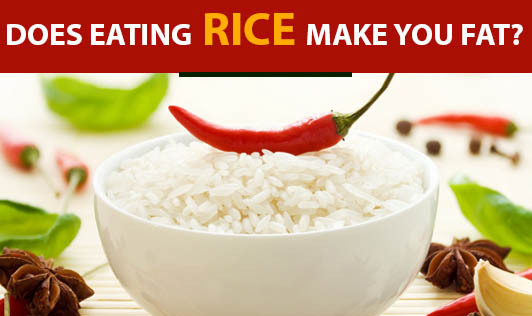 Rice dishes like biryani, pulao, mixed rice and masala rice can cause weight gain because they are normally high in fat and calories. But plain steamed rice is innocent and by itself cannot increase weight. Choose steamed rice over mixed rice. Much more healthy varieties of rice are brown rice, parboiled rice (aka boiled rice), unpolished rice and hand-pounded rice. These varieties contain more vitamins and fiber, and also help to maintain your weight. Keep a check on quantity of rice intake. Thumbs up to rice, especially the healthy varieties! !